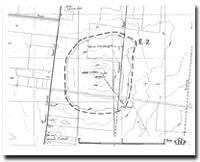 Sites of Geological and Geomorphological Significance in the Shire of Otway (1984) by Neville Rosengren. Location Eyensbury - 905175. Shire of Melton. 4.5 km southeast of Melton Reservoir. 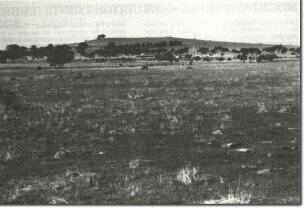 E2 - Mount Cottrell, one of the most voluminous of the lava sources for the Werribee Plains. Greig Road, Mount Cottrell Road. Mount Cottrell is a volcanic cone formed by the radial eruption of numerous lava tongues, with no intervening pyroclastic eruptions. The flows are symmetrically distributed around the vent producing a cone of geometric shape. Although achieving a height of only 200 m, the cone is of considerable bulk with flows extending almost 10 km to the south. The massive nature of this basalt cone is not readily appreciated when viewed from close quarter, but is readily apparent when seen from a distant point such as the You Yangs. The slopes are of low angle, apart from those at the summit where a hard dense basalt bluff 5 to 6 m high surrounds a shallow crater. The surface of the basalt dips toward the crater at generally low angles, except for the north sides where dips reach 30o. Regional. There are two aspects to the significance of the site - the specific nature of the bluff and crater at the summit, and the extent of the radial flows. The cone is the most massive of the Werribee Plains volcanoes and gave rise to a number of distinct lava flows. The basalt rim is of particular interest as it has similarities to the cappings on the volcanoes of the Gisborne area, although Mount Cottrell is a much younger eruption point than these. The flows from this point towards the west influenced the course of the Werribee River and may have dammed the stream near the junction of the Djerriwarrh Creek. Class 2. The basalt rim and upper slopes of the volcano should not be quarried or be built on by other farm service buildings. Further residential or industrial building should not be permitted above the 170 m contour.